Yes, at the end the most awaited marriage of Indian Captain Virat Kohli and Anushka Sharma become reality in Italy today. 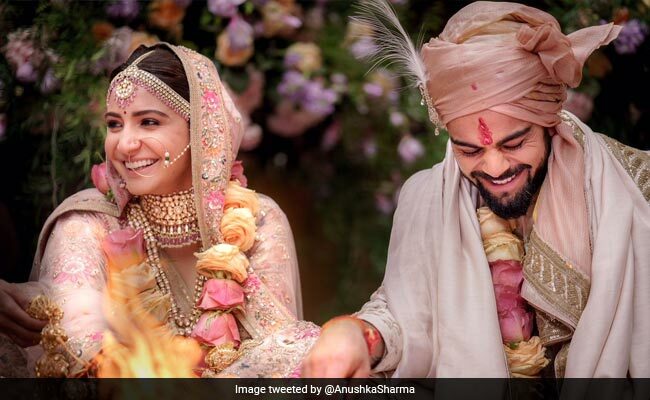 A tweet posted on Anushka's official account read: "Today we have promised each other to be bound in love forever. We are truly blessed to share the news with you. This beautiful day will be made more special with the love and support of our family of fans & well wishers. Thank you for being such an important part of our journey." Virat and Anushka had an exclusive marriage according to Hindu rites, said a statement released on behalf of the actress. The wedding venue was a countryside resort in Tuscany where security had been massively stepped up for the nuptials. Entry to the resort was strictly by invitation. A video of what appeared to be wedding preparations being made at the resort went viral over the weekend. The newly wed couple will travel to South Africa where Virat will start prepping for the upcoming series and Anushka will spend New Year's Eve with him and return in the first week of January to begin the next schedule of Anand L Rai's film with Shah Rukh Khan in Mumbai. She will also start prepping for Sui Dhaaga as the shooting for the same starts in February 2018 with Varun Dhawan. Anushka will also be busy with the marketing and promotions of Pari which is releasing on 9th February.